Company leaders defend their huge salaries by saying bonuses incentivise CEOs to perform better. Doesn’t this same principle apply all the way down to the shop assistant and their Sunday penalty rate? Andrew Robertson writes. One issue you can guarantee the Government will be fudging in the election campaign is the push by employers in the retail and hospitality industries for weekend penalty rates to be reduced or abolished. Already the Productivity Commission has recommended Sunday penalties be lowered to the same level as Saturday’s. The Government has distanced itself from that recommendation, and with good reason (even if it may quietly agree with it). Offending rich retirees by winding back their overly generous superannuation tax breaks is one thing. They’re never going to vote Labor. Slashing the pay of millions of ordinary workers in pubs, clubs, restaurants, shops, cinemas and the like, is another thing. They will vote Labor! The arguments for both sides of the penalty rate debate have been well aired, so I won’t go into them here. But there are a few things that don’t quite add up. Chief executives will tell you they spend a lot of time trying to work out how to get the best out of their employees. I’ve seen former Wesfarmers boss, Michael Chaney, react quite angrily to a fellow journalist’s question that suggested otherwise. As exhibit A, company boards feel the need to continually increase the pay of their senior executives to incentivise them (as the jargon goes) to perform better. And to help their senior executives do that job better they get paid huge penalty rates in the form of bonuses which, in many cases, dwarf their base salary. For example, according to James Hardies’ Remuneration Report, CEO Louis Gries’ base salary in 2015 was $950,000. His total pay for the year was a whopping $11.7 million. It’s a story repeated right across the corporate sector and it has fuelled the massive increase in executive pay in the last 20 years. Economics professor Andrew Leigh, who’s now a federal Labor MP, has co-authored a detailed study of executive pay at BHP Billiton. It shows that as recently as 1982, the CEO was on less than 10 times the average weekly wage. When BHP hired the American, Paul Anderson, in the late 1990s its pay scales exploded, hitting a high in 2010 when Marius Kloppers received 250 times the average weekly ordinary time earnings (AWOTE). In fairness to BHP, the mining bust has forced current CEO, Andrew MacKenzie’s, salary down to a still extraordinary 89 times AWOTE. Sam Walsh’s $8 million at Rio Tinto is 103 times AWOTE, while Louis Gries’ $12 million at James Hardie is 150 times. This brings me back to the shop floor, literally. A level 1 shop assistant, working under the Retail Industry Award, gets $18.99 an hour, which is less than half AWOTE. That rises to $23.74 an hour on Saturdays and $37.98 for Sundays. The question that comes to mind is this: If, as company leaders tell us year in and year out, those at the top need to be paid enormous fortunes on top of their base salaries to get them to do a good job, why is it different at the bottom? How will cutting the salaries of the staff, that company leaders also repeatedly tell us are their most important asset, incentivise them to do better? How will that not trash morale and with it performance, and in the end, hurt the bottom line? And one final point. Before company leaders complain that I am comparing apples with oranges: yes, penalty rates are paid just for turning up. But so too are CEO bonuses. 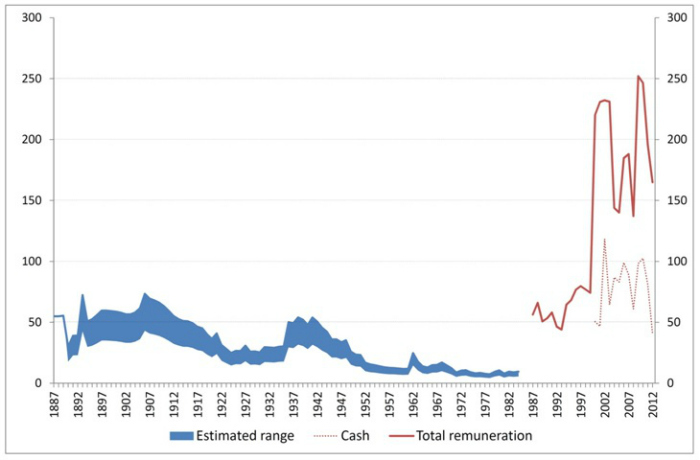 History tells us very clearly that bonuses get paid regardless of company performance. Andrew Robertson is the chief reporter for ABC’s The Business. Posted on May 17, 2016, in ConspiracyOz Posts. Bookmark the permalink. Leave a comment.